Avant-garde design and elegance 100% Made in France. Since it was founded in 2005 on the initiative of Isabelle Mortreuil, MG has been combining interior and exterior design codes with a shrewd and sensitive eye. Indoors or out, the collections exude simplicity, cheerfulness and a form of elegance that does not take itself too seriously. Elaborately worked, cut, bent and fashioned in our manufacturing workshops near Lyon, metal remains our preferred material. 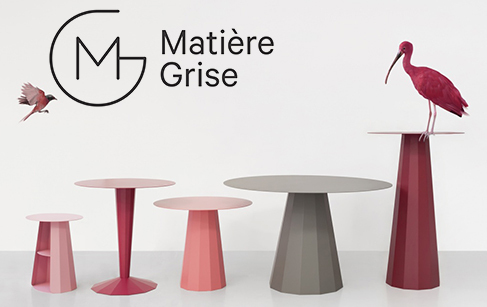 Matiere Grise in-outdoor collections exploit clean-cut lines enhanced by a wide range of different hues. In 2014, MG will once again be working in collaboration with designers Luc Josancy and Rémi Casado and will be reaching out to the avant-garde of French design by creating a collection with Constance Guisset. The resulting new collections are both refined and elegant in design.